The Fiat 124 Elaborazione Abarth is premiering tomorrow at the New York Auto Show. Below is the full press release and details on the car for your enjoyment. Make sure you follow the Fiat 500 USA Instagram, Twitter and Facebook pages for images throughout the day tomorrow! 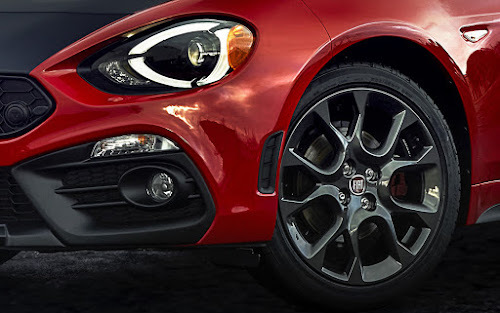 March 22, 2016 , Auburn Hills, Mich. - Since the introduction of the Fiat 500 Abarth at the 2011 Los Angeles Auto Show, the DNA of Abarth has connected with driving enthusiasts in search of a sharp, wicked, fun-to-drive machine. 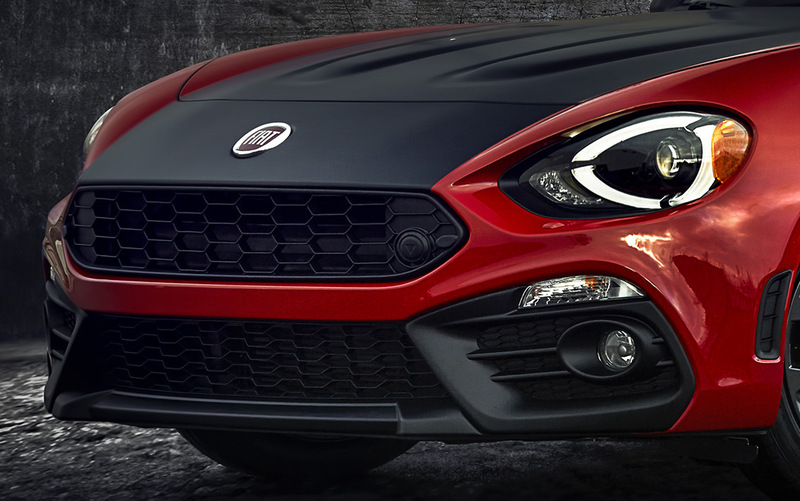 Continuing the legacy of Karl Abarth’s performance-inspired vehicles known for their rich racing heritage, the 2017 Fiat 124 Elaborazione Abarth will debut at this year’s New York International Auto Show. The Fiat 124 Elaborazione Abarth is the heir of the roadster that drove Fiat to its first European Rally Championship win in the 1970s. Applying the Abarth formula, the new 124 Spider is designed and built for thrills and performance. Key Abarth features include rear-wheel drive, a sophisticated suspension and a four-cylinder turbocharged MultiAir 1.4 Turbo engine with best-in-class 160 horsepower that is available with a six-speed manual or six-speed automatic gearbox with paddle shift. The 2017 Fiat 124 Spider Elaborazione Abarth is the latest addition to the Fiat 124 Spider lineup, offering added performance features for a sportier, more spirited driving experience. While all Fiat 124 Spider models deliver responsive handling and excellent power-to-weight ratio in a robust rear-wheel-drive package, the Elaborazione Abarth model builds on the Spider’s engaging driving dynamics to offer even more fun for performance enthusiasts. The 2017 Fiat 124 Spider Elaborazione Abarth features the proven turbocharged 1.4-liter MultiAir four-cylinder engine, delivering 160 horsepower and 184 lb.-ft. of torque and is paired with either a six-speed manual transmission or a six-speed automatic transmission with paddle shifters. The Elaborazione Abarth-exclusive Sport Mode changes the calibrations of the engine, automatic transmission, electric power steering and dynamic stability control system to ensure a sporty, responsive and performance-oriented driving experience. A mechanical limited slip differential, featuring a low torque bias ratio, provides improved traction and handling, as well as improved launch performance and power delivery during cornering. The Elaborazione Abarth’s unique sport suspension includes mono-tube Bilstein front and rear shock absorbers for increased traction and more precise handling. The available Brembo braking system with 17-inch alloy wheels offers monoblock aluminum calipers with four pistons, allowing for improved braking. 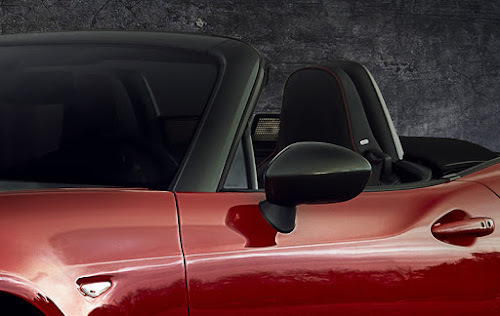 With a streamlined silhouette and a stretched bonnet, the Fiat 124 Spider Elaborazione Abarth has an aggressive appearance, with unique front and rear fascia, black side sills, 17-inch Gun Metal aluminum wheels and a sport-tuned, chrome quad-tip exhaust with a unique exhaust sound. The Gun Metal header, mirror cover and roll bar complement five available paint colors: Bianco Gelato (White Clear Coat), Rosso Passione (Red Clear Coat), Nero Cinema (Jet Black Metallic), Grigio Argento (Gray Metallic) and tri-coat Bianco Perla (Crystal White Pearl). The interior design reflects the performance-oriented details for which cars sporting the Scorpion badge are famous. There is Rosso (red) stitching throughout, including on the leather-wrapped steering wheel, wrapped instrument cluster hood, lower instrument panel and parking brake. A matte black instrument panel bezel, unique instrument cluster, aluminum-accented sport pedals and unique gear shift knob help to differentiate the Elaborazione Abarth model. Unique Nero (black) leather/microfiber seats are standard, while leather seats in Nero (black) or Nero/Rosso (black/red) are available. For true performance enthusiasts, leather and Alcantara Recaro seats are also available in Nero (black). The all-new 2017 Fiat 124 Spider revives the storied nameplate, bringing its classic Italian styling and performance to a new generation. 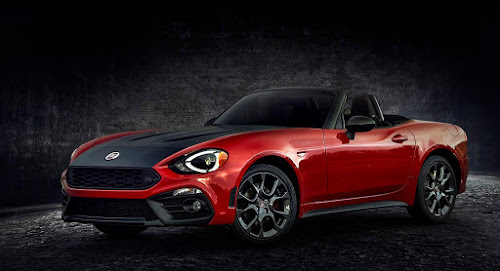 Paying homage to the original 124 Spider nearly 50 years after its introduction, the 2017 Fiat 124 Spider delivers the ultimate Italian roadster experience with driving excitement, technology and safety combined with iconic Italian design. The 2017 Fiat 124 Spider lineup also includes the Classica and Lusso models. To celebrate the return of the classic nameplate, the first 124 vehicles will be offered as a limited-edition Prima Edizione Lusso, featuring an exclusive color combination and commemorative badging. The all-new Fiat 124 Spider will arrive in FIAT studios in North America beginning in summer 2016. Discuss on the Fiat 124 Forum! You can never go wrong with black and red.